Background : Son of Edith Jane Bell. 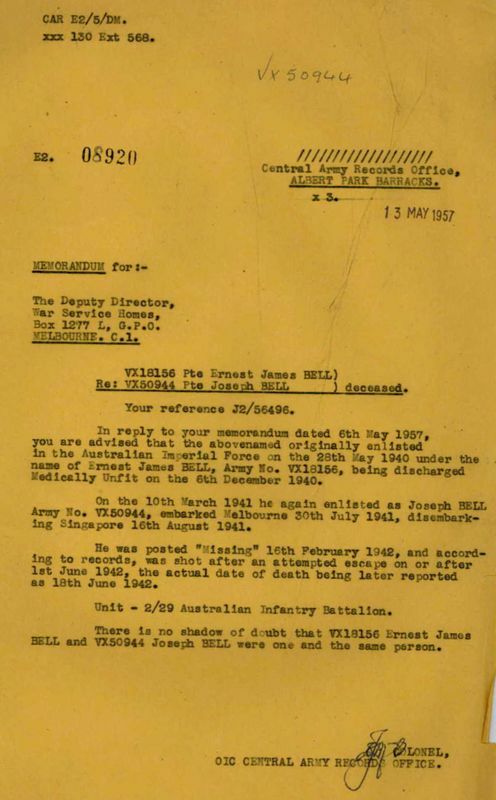 Re-enlisted 10/03/1941 as VX50944 BELL, JOSEPH with 2/29 Australian Infantry Battalion. Lowest photo taken at re-enlistment. Occupation on re-enlistment : sail maker. Reported missing in action in Malaya 16/02/1942. Shot dead by the Japanese after attempted escape whilst prisoner of war 18/06/1942. Service & personal summary (as 2/2 Pioneer) At enlistment : single. 1 year 8th Battalion Australian Military Forces previous military experience. At discharge : height 5 feet 4 inches, brown eyes, dark complexion, dark brown hair. Marital status : single. Marks / scars : broken nose. Full time war service : A.I.F. 28/05/1940 to 06/12/1940. Discharge certificate no. 16974. 28/05/1940 Taken on strength Recruit Reception Depot Caulfield, Victoria. 30/05/1940 Posted to 2/2 Pioneer Battalion Puckapunyal, Seymour, Victoria. 22/07/1940 Admitted Puckapunyal 4 Australian General Hospital, Seymour, Victoria with dislocated hand, X ray. 25/07/1940 Discharged Puckapunyal 4 Australian General Hospital, Seymour, Victoria to unit. 04/11/1940 Admitted Puckapunyal 4 Australian General Hospital, Seymour, Victoria with urethra discharge. 04/12/1940 Transferred to Discharge Depot Royal Park, Victoria. 04/12/1940 Taken on strength from 2/2 Pioneer Battalion to Discharge Depot Royal Park, Victoria. 06/12/1940 Discharged as medically unfit for service not occasioned by his own default.